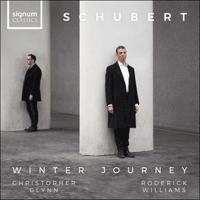 A 'Winter Journey' to offer English-speaking listeners something of the experience that so shocked Schubert's friends when he first sat down at the piano to sing them in 1827. The gloomy atmosphere may well have been influenced by Schubert’s failing health. Although at the height of his powers, he was slowly dying of the syphilis he had contracted around five years earlier. ‘My usual headaches are assailing me again’ he wrote in a letter, while his friend Mayrhofer remembered that ‘life had shed its rosy colour’ and ‘winter had come for him’—a choice of words that suggests he, like Spaun and almost every writer since, found it hard to separate the events of Schubert’s life from the ‘spine-chilling’ songs of 1827. The Winter Journey that Schubert played and sang that night is a portrait of brokenness. It tells the story of a wanderer who has been unlucky in love as he sets out on a long and lonely journey through a bleak wintry landscape that mirrors the state of his own inner world. The major events of the story are all over before the cycle begins. It is about a failed love affair, yet contains no love songs. It describes a journey but arrives nowhere in particular. Nothing much happens. The traveller swings between sadness and defiance, paranoia and mockery, self-delusion and a fearless contemplation of the bleakest realities of life. It begins with an ending and ends (perhaps) with a beginning. No wonder his friends were ‘dumbfounded’. The poems are by Wilhelm Müller, the same writer, translator, soldier, traveller, librarian and misfit who had provided the poems for The Fair Maid of the Mill (Die schöne Müllerin) some years earlier. Nicknamed ‘the Greek’ for his love of that country and its literature, Müller was also deeply committed to the ideal of simple, honest German poetry and valued ‘naturalness, truth and simplicity’ above all. His verse was of a type that aspired to be set to music and he once wrote of his hope that a gleichgestimmte Seele (‘like-minded soul’) would one day ‘hear the tunes behind the words and give them back to me.’ But as he lay dying in Dessau in 1827, Müller almost certainly had no idea that Schubert, whom he probably never met, had discovered his Winterreise poems and was busy in Vienna setting them to music. Schubert ends his Winter Journey with the most mysterious soliloquy in all music. The traveller happens upon a beggar sitting on the street playing a hurdy-gurdy. Seemingly oblivious, he neither speaks nor listens but just picks out a mournful, banal tune with frozen fingers. ‘Will you play your broken music to my broken song?’ the traveller asks as, with one last turn of the hurdy-gurdy’s handle, the cycle ends, but also seems to stretch out into the distance. Who is the hurdy-gurdy man? Another shadowy, refracted image in the wanderer’s troubled mind? Or even his Doppelgänger, the traditional harbinger of death in German folklore? Or is it possible that the wanderer has met another archetypal stranger—a gleichgestimmte Seele—with whom he might share his story? Perhaps there is even a sense in which the hurdy-gurdy man is anyone and everyone who hears this sad and fathomless tale. A haunting recording of this final song, sung in English in 1934 by the baritone Harry Plunket Green, was partly what inspired me to invite Jeremy Sams to create a modern English version of Winterreise. Singers of the pre-war generation often sang Lieder in translation, perhaps because communicating directly with the audience was thought to be as important as fidelity (or another kind of fidelity) to the composer’s original intentions. Something is always lost in translation, of course; but discoveries can be made too. Wilhelm Müller knew that—it was only through his translation of Marlowe’s play that Goethe came to know the story of Faust which inspired his own masterpiece. Haydn knew it too, when he composed The Creation so it could be sung in two languages. 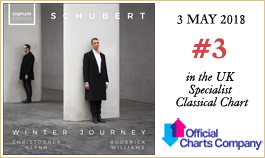 We hope this Winter Journey can offer English-speaking listeners a way to experience the story’s sense alongside the music’s sound with something of the same directness and immediacy that Schubert surely intended when he sat down at the piano in 1827 and sang these songs for the first time to his friends. One of the joys of translation, and certainly its greatest privilege, is to find oneself more like an author than a reader. You’re inside the room looking out, as it were. Which gives one, if not ownership, then a degree of empathetic insight into the creative process. Schubert’s two song cycles are a case in point. Plainly quite different works—and this difference begins (as all songs do) with the poetry. In 1823 (Die schöne Müllerin) Schubert was coming to terms with being ill—in 1827 (Winterreise) he knows the illness will kill him. In Die schöne Müllerin the poetry (and therefore the music) is contemplative, sometimes directionless and often obsessively repetitive. Winterreise is the opposite. There is no aimless wandering. The hero doesn’t follow a brook, he follows his own footsteps. It begins with a disaster, a farewell from a lover gazumped by a richer suitor. Whereafter our hero doesn’t muse, like the Miller, he’s driven to a journey whose destination, like Schubert’s, is most likely death. Winterreise is catastrophic, where Die schöne Müllerin is often merely strophic. Müller’s verse is jagged, terse and timeless. And its hero is modern, political, urban. He curses the money-grubbing middle-classes snoring in their feather beds. He is a free spirit, a visionary, who turns landscape into mindscape and pain into poetry. And most vitally, he squeezed music out of Schubert’s broken heart. So our hero, even in 1827, is modern. An angry young man, an outsider. Nothing romantic here—the babbling brooks are frozen solid, the fields of flowers are snowed under. There is an idealised linden tree (the stuff of Romantic landscape) but he pointedly walks past it. That’s why, for me, his language has to be modern, detached, straightforward—self-mocking, even. I’ve tried to avoid the inversions present in all kinds of verse, but particularly in song translations. Our hero doesn’t meander or reflect backwards, he presses on to the end of the line. Paramount for me is how the text sits on the music. If occasionally I’ve re-invented or re-rendered the original it is in search of the answer to what should be the translator’s only question—what English text would have led to that music? Achieving that, while respecting rhyme, stress, and above all trying to find poetic meaning in melodic and harmonic moments, is like a devilish game of four-dimensional chess. Ultimately, maybe, impossible—but, I think, a worthy pursuit.